The European Union is one of the most attractive markets for Pakistani fruits and vegetables because of its size and the paying capacity of its consumers. Within the EU, Germany, United Kingdom, Belgium, Italy and the Netherlands are major importers of fresh Pakistani fruits and vegetables. In the European market, Pakistani citrus has an insignificant 0.09pc share. In the sub-category of mandarins and clementines, Pakistan has a market share of 0.04pc. As a table fruit, Pakistani Kinnow�s availability in the European market is irregular. Kinnow is mainly used as a raw material for juice by a few big companies in Europe, but it is not consistently imported as a table fruit. Foreign sales of citrus constitute more than one-third of the $300 million in proceeds from export of all fruits from Pakistan. With annual citrus production of nearly 1.5 million tonnes over an area of around 200,000 hectares, Pakistan is the 12th largest producer of citrus and the largest producer of Kinnow in the world. According to an estimate, nearly 95pc of total Kinnow production is in Pakistan. This concentration of production makes Kinnow essentially a Pakistani �specialty� fruit. 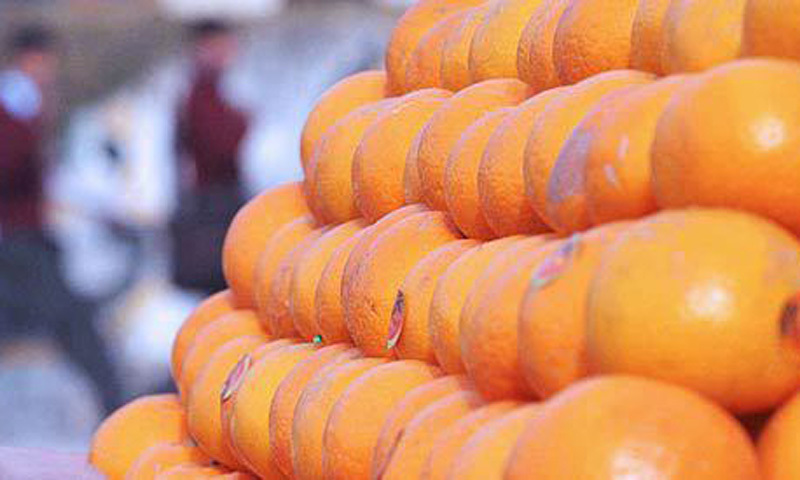 In the mainstream market segment, the Pakistani Kinnow has to compete with seedless mandarin and clementine from Spain, Morocco, Argentina and South Africa. Though smaller in average size and harder to peel, mandarins from competitors are claiming a larger market share because of being seedless. In the ethnic segment, Kinnow supplies are intermittent. As the Kinnow has to be marine-shipped in container-loads, importers usually take chances with only one or two shipments during the entire season. They are risk-averse and hesitate to place consecutive orders with a gap of 1-2 weeks before evaluating the response to their first container shipment. And food safety is the prime concern in the European market. Food products must comply with stringent sanitary and phytosanitary (SPS) requirements. The European consumer is quite demanding regarding the taste, quality and presentation of food products. The consistency of fruits in terms of size, shape, weight, colour and level of ripeness are important parameters for consumers in making their buying decisions. There is increasing concern for traceability, social accountability, sustainability, fair trade practices and environmental protection in the production and trading of food as well. However, the above-mentioned challenges are surmountable. The Pakistani Kinnow, despite the disadvantage of having seeds, has the potential to penetrate the European market provided a consistent long-term strategy is implemented. For this, research and development on seedless Kinnow varieties needs to be fast-tracked. While there has been some progress on the development of these varieties, they are not available in bulk volumes. Food exports are also linked with food tastes, which are deeply cultural in nature. The export of food �taste� has to precede the export of the food �product� itself. Pakistani food products sold abroad are mainly consumed by South Asian communities, and the volume of these exports to a country is directly proportional to the size of the ethnic community there. For entry into the mainstream segment of the EU market, �taste development� has to be the fundamental element of the strategy to promote Kinnow. Unless seedless Kinnow is available in commercial quantities, a �pull marketing� strategy at the shelf-level is required to develop consumers� tastes to such a level that they are ready to accept seeds in a Kinnow that has a superior taste. For taste development, an extensive campaign of tasting arrangements and free sampling at points of sale would be required. Such a campaign at a small scale is being organised by Pakistan�s Trade Office in the Netherlands for the last four years, but it needs to be substantially broadened. The disadvantage of seeds can also be offset by positioning Kinnow as a �juicy mandarin,� instead of a �table fruit� in the mainstream European market. Citrus press filters seeds at the squeezing stage and thus the consumer is spared the annoyance of spitting the pits at the consumption point. Currently, orange varieties in the EU are already categorised into �table oranges� and �juicy oranges�. A similar distinction can be made between table mandarins and juicy mandarins. In the ethnic market segment, the availability of Kinnow needs to be increased. Currently, supplies are intermittent, and a regular demand-supply pattern is not established. Pakistan�s Trade Offices in European countries can help overcome this problem by coordinating with importers to stagger their shipments during the entire season. Lastly, we also need to increase our focus on the traceability of the products and motivate farmers, processors and exporters to attain global certifications. This drive needs to be intensified, and farmer awareness programmes, especially those on use of fertilisers and pesticides, need to be increased.